Our most compact stationery. It's about the length and width of an average lady's hand, so it fits in most pockets. 60 pages with 18 lines per page. It's a touch smaller than A5 but much bigger than A6. It fits easily in a bag but not in a pocket. This has the highest page-count of all our products. It's the width and height of a large novel. 140 numbered pages with 26 lines per page. 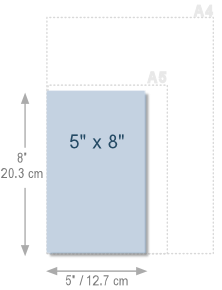 Almost the width of A4 but a few cm shorter in height. They're the size of a large school exercise book. Always 100+ pages with numbers. (Look Inside). Most of our specialist log books and planners are this size. Only the Monthly Budget Planners, Graph Paper Notebooks, Garden Journals, Fitness Journals and the Sketchbook are larger (8.5" x 11"). Prices vary, but all our stationery costs under $6 / £5 + Amazon P&P. All our products have tough paperback exteriors. They're bound with perfect (rather than spiral) binding so the pages won't begin to fall out after just a few weeks. You'll find all the interiors are high quality (55 lb) pure white acid-free paper.